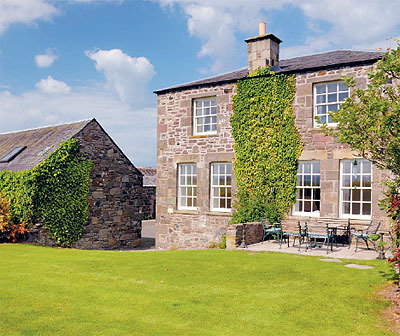 Chapelhill farm is a wonderful equestrian estate near Gleneagles in Perthshire. The property is a charming Victorian five-bedroom country house which dates from around 1860 and has been completely refurbished. The old farmhouse has a drawing room, reception, sitting room, dining room/kitchen, an office with a store room and a tack/dog room. Upstairs are three en-suite bedrooms, two further bedrooms and a family bathroom. Outside the garden is mainly laid out to the west of the house where there is a terrace with superb open views to the hills. A trellised archway leads to the front of the house where beds of shrubs edge the front driveway. The large courtyard lies to the north of the farmhouse and provides ample space for parking and turning cars. There are also detailed existing plans to convert the steadings attached to the property into three four-bedroom houses. In addition to this are 26 acres of grass paddocks extending down to the Cowgask Burn which include some rough pasture and a pond. The farm is just 13 miles from Perth and is an extremely beautiful situation, close to the A9 motorway. Excellent fishing is available on the nearby Rivers Earn and Almond and pheasant and grouse shooting is available for lease in the area. There is also fantastic golf nearby as well as lots of walking and riding in the surrounding hills. The guide price is £795,000. For further information please contact Strutt & Parker on 0131 226 2500 or visit www.struttandparker.co.uk.